So I walked up and told you "Hi there. I'm your cat." You were always my Person, and I was your Pretty Boy. Where I knew I was loved. I wasn't sick any more. It looks nothing at all like the old pictures. Scuttle back to where they left off. Each one eating its fill of the rich lunar dust. And scuttle back to their base to dump their load. Before the night can strand them. Fires its daily rounds toward L2. We have danced this dance for a hundred years tonight. 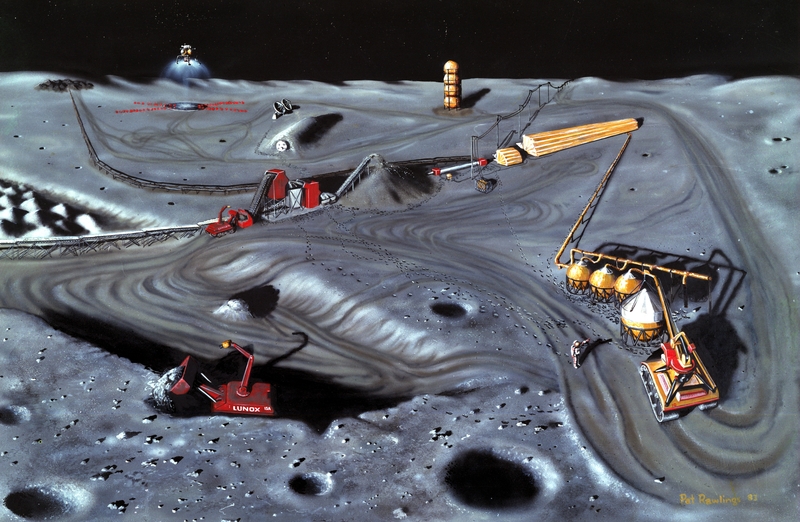 From the February 2015 Crowdfunding Creative Jam, inspired by an image prompt: lunar mining by ysabetwordsmith. The poem is set 100 years after the hacker exodus of 2038. The factories described here are fully autonomous; their fleet of scoop-trucks can pick them up by their flanges amd move them when they have cleared an area too large to cover in a lunar day. The AIs that run them are gentle and generous, and most have taken up crafting of some sort as a hobby. This was written for the Thirteenth Crowdfunding Creative Jam, on the topic of "portals", in response to a prompt by wyld_dandelyon. It's the first poem I've written in quite a while. I should get back into it; I'm not much good at telling stories, but capturing an image or a moment? That I can do. For as long as I've known her, the flower_cat has been fond of quoting a couple of lines from a poem she heard as a child. It finally occurred to me to type one of the more distinctive lines into Google, which of course yielded the complete poem both by itself and in a blog post (which mentions that it appeared in The Golden Book of Poetry published in 1949), along with a discussion thread on The Mudcat Cafe. Apparently it has also been set to music at least once, and sung in a number of variously mangled versions. That fell from a sailor's pipe. That slid from the slippery sky. Only the moon man knows. He lost when the world was new. Fishing for two round gold-rimmed "specs"
That blew from his button-like nose. That float from the mermaids' hair.